Leading animal campaigns charity OneKind is putting on an exhibition of Scottish wildlife and animal art to raise money to help end cruelty to Scotland’s animals. After a successful launch last year, Art for Animals returns on the 19-25 October at the Breeze Art Gallery in Edinburgh. The event will celebrate Scotland’s magnificent wildlife while also raising awareness of the work OneKind does to protect it. The charity is currently campaigning for a real fox hunting ban, an end to mountain hare culls, and a moratorium on plans to expand the salmon farming industry in Scotland until animal welfare and environmental issues are addressed. This year’s event includes the work of 14 artists from all over Scotland – Clare Baird, Paul Bartlett, Leo du Feu, Jan Ferguson, James Flowerdew, Elspeth Guthrie, Gemma Hare, Alison Hartley, Michelle Hewitt, Madeleine Juniper, Bibo Keeley, Hayley Mills, Romain Pizzi and Susan Smith – who will be exhibiting a mix of artwork including paintings and sculpture. “We’re delighted that Art for Animals is returning this year and we can’t wait to showcase the amazing work of the artists who take their inspiration from Scotland’s animals. This year’s event is in partnership with Breeze Art Gallery in Jenners. Breeze has waived all charges to the artists for displaying their work, and all sales will include a 30% donation to OneKind’s campaigns and education work that aims to end cruelty to Scotland’s animals. 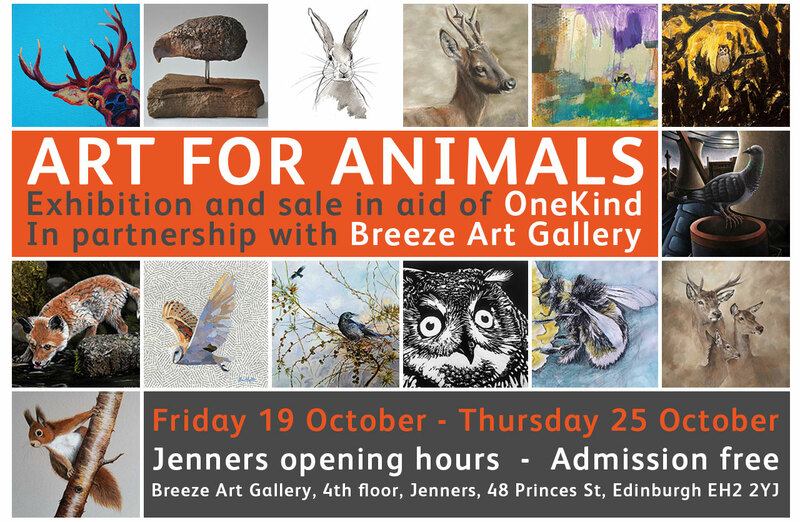 Art for Animals will take place at the Breeze Art Gallery, Jenners, 48 Princes Street, Edinburgh, EH2 2YJ from 19 to 25 October 2018.